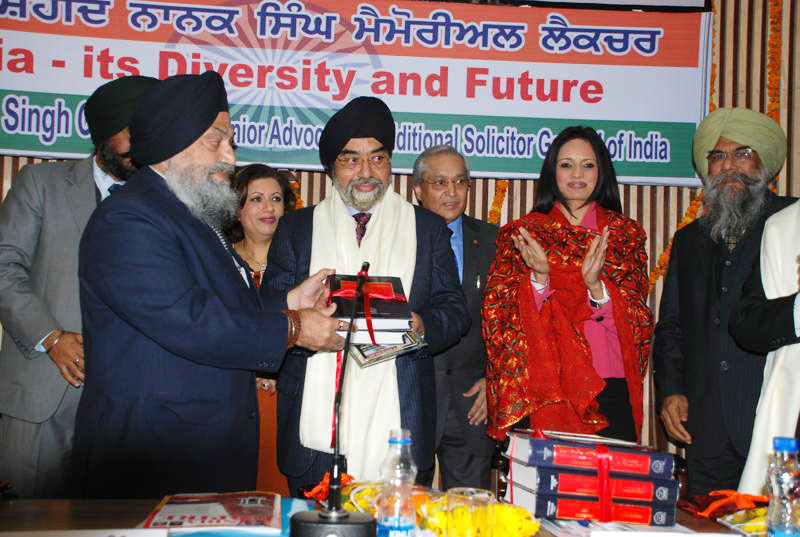 Mr. Amarjit Singh Chandhiok, Additional Solicitor General of India delivered the third Shaheed Nanak Singh Memorial Lecture to a packed audience. 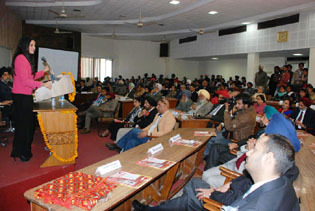 People from the USA, UK and Canada were amongst the guests who came to hear the lecture. 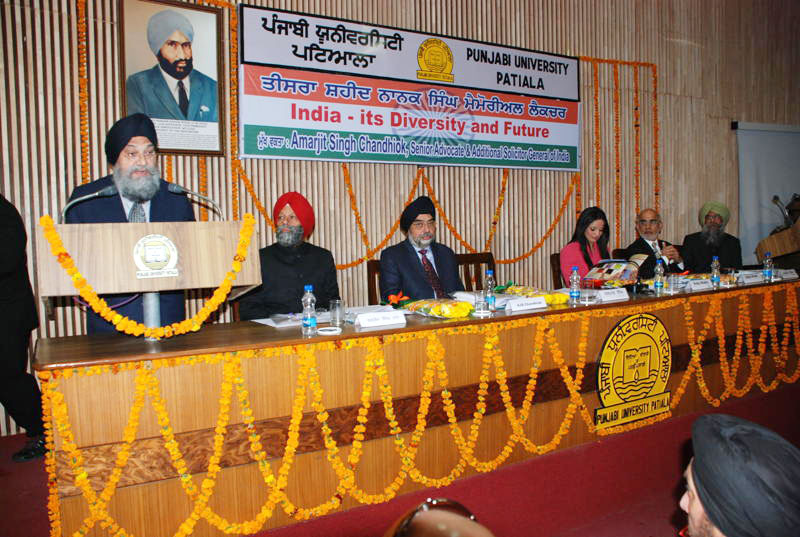 In his keynote speech on “India’s Diversity and Future”, organised by the Punjabi University’s Sri Guru Tegh Bahadur National Integration Chair. 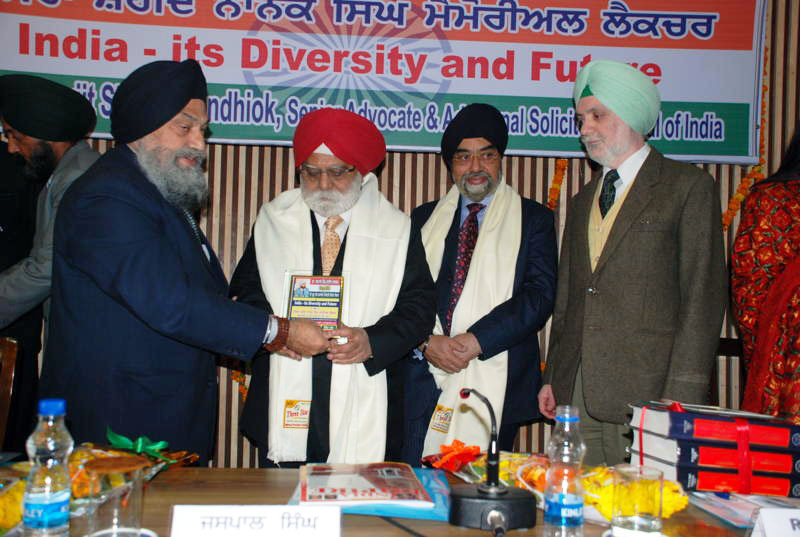 Mr Chandhiok paid tribute to Shaheed Nanak Singh who championed the cause of unity and religious tolerance and opposed the division of India on the basis of religion alone. 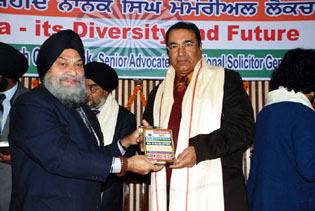 He also praised the widow of Shaheed, Mrs. Harbans Kaur who brought up 8 children in the most difficult and testing circumstances, but still gave 5 of her sons to the Armed Forces to defend the integrity of India. 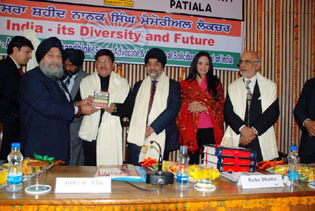 Mr Chandhiok said, “India is a land of contrasts as it has assimilated people belonging to different ethnic, religious, castes, linguistic and regional identities. 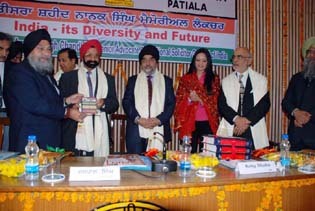 While these identities co-existed for centuries and presented a mosaic culture, we are presently in the grip of a kind of fear psychosis, created mainly by the present social and political ill.” He further advocated the idea of private-public partnerships to promote academic excellence as the State alone could not aid higher education for all. “If we do not resort to innovative measures, then we will end up with educated unemployment and unemployable degree holders”, he said. Canadian M.P., Dr. Ruby Dhalla laid emphasises on investing in institutions of primary and higher education, empowerment of women folk and motivating the youth to transform the vision of a shining India into reality. Women in India, she said, are themselves responsible for their poor plight as a large majority of them, especially in villages and suburban areas choose to remain as “girls-next-door”. She endorsed the idea of the Vice-Chancellor, Dr. Jaspal Singh to forge stronger ties and a lasting relationship between Punjabi University and Punjabi NRIs settled in Canada and elsewhere to promote Punjabi and religious pluralism, which happen to be the major fortes of the Punjabi University. 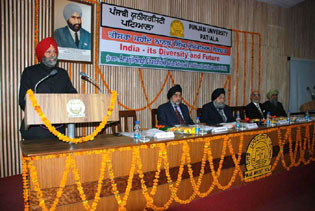 In his presidential address, the Vice-Chancellor, Dr. Jaspal Singh referred to the Guru Granth Sahib as the richest source of the concept of unity in diversity as it advocated not only accepting and respecting identities of others, but also going to the extent of defending them at every cost. Guru Tegh Bahadur gave up his life to defend the identity of Indians. 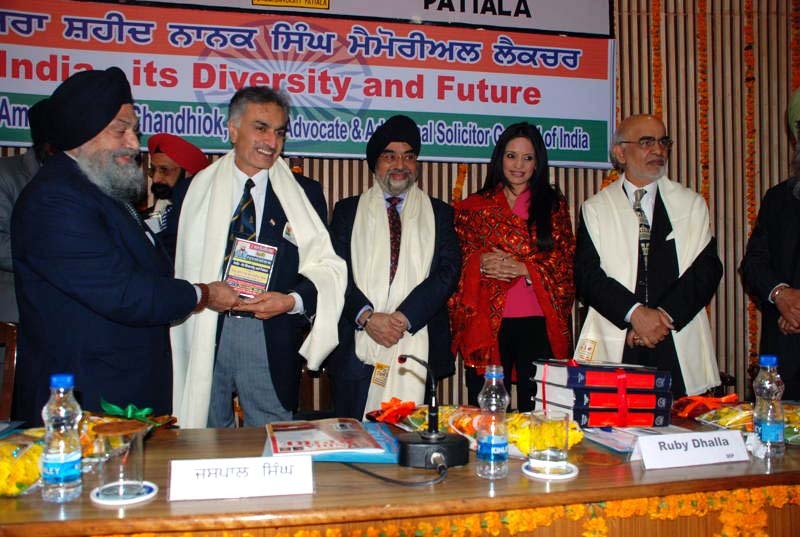 The holy scriptures attempt to shatter all types of boundaries, be they cast, language or religion. By paying obeisance to this great scripture amounts to worshiping all religions. 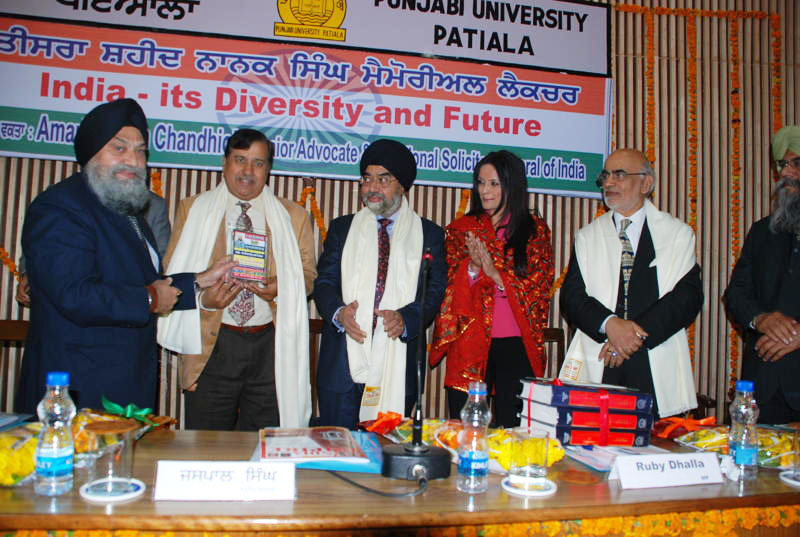 The Vice-Chancellor honoured Mr. Chandhiok, Dr. Dhalla, Lord Daljit Rana, and other dignitaries who graced the occasion by presenting to them mementoes and sets of University publications. 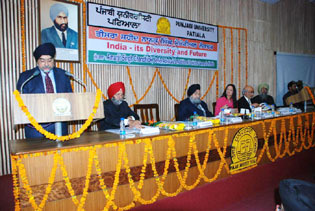 Lord Daljit Rana said that social and religious divisions were bigger dangers to the international community as compared to political divisions. He praised Haryana Government for making available 20 acre land for a museum to showcase the sacrifices of India’s freedom fighters. 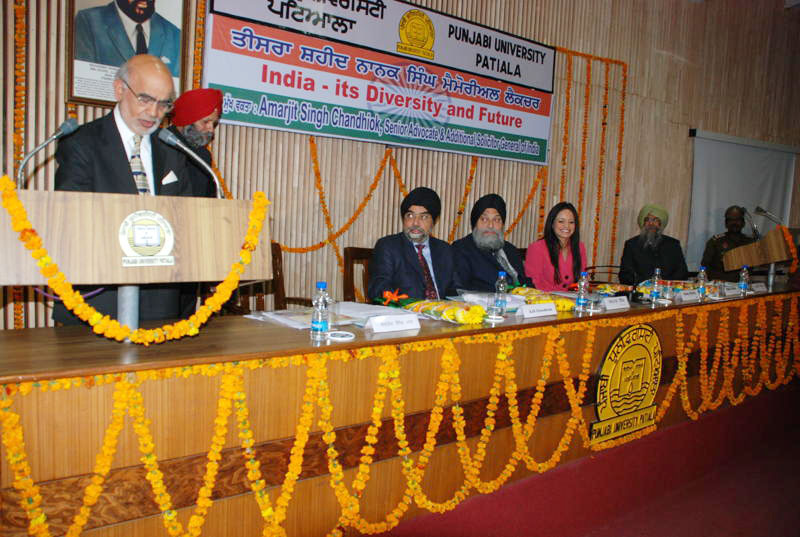 Prof. Baltej Maan, Head of the Chair welcomed the guests and Dr. Manjit Singh, Registrar, proposed a vote of thanks. 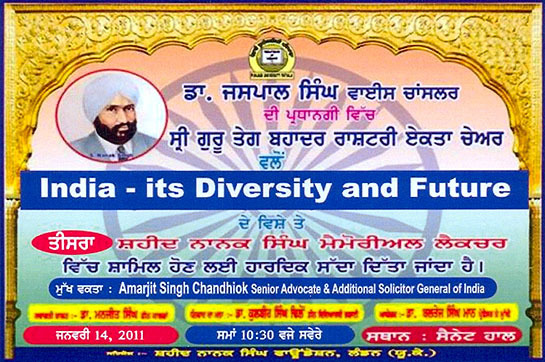 Please click on photograph to downlaod image in high resolutions. Guest of Honour Mr Amarjit Singh Chandhiok delivering the 3rd SNS Memorial Lecture. 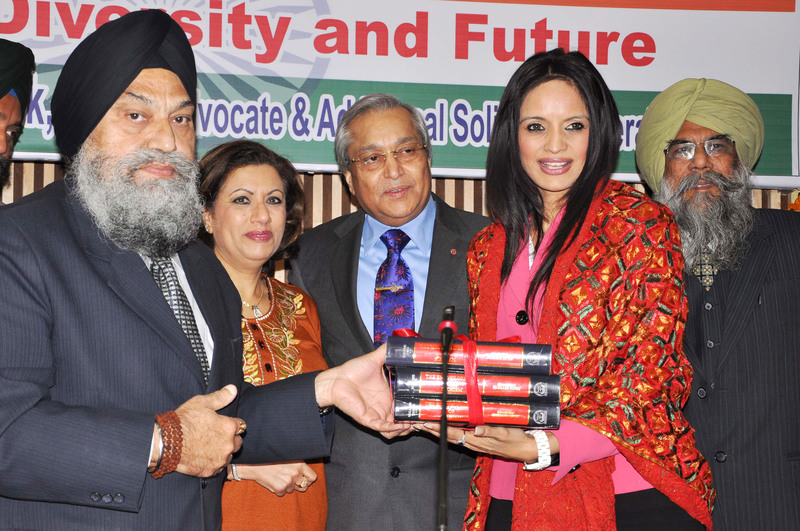 Dr. Ruby Dhalla, Member of Canadian Parliament addressing the guests. 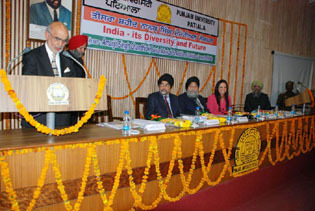 Prof. Dr. BS Mann welcoming the guests. 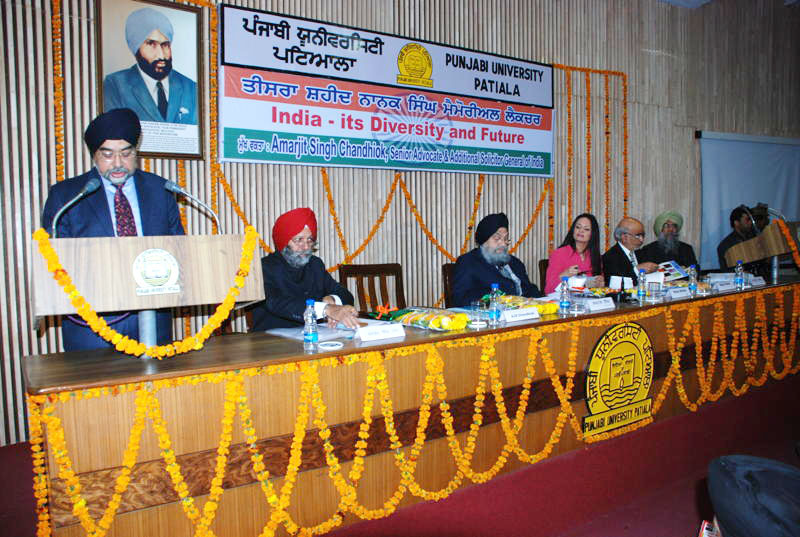 Vice Chancellor, Punjabi University, Dr Jaspal Singh Addressing the guests. 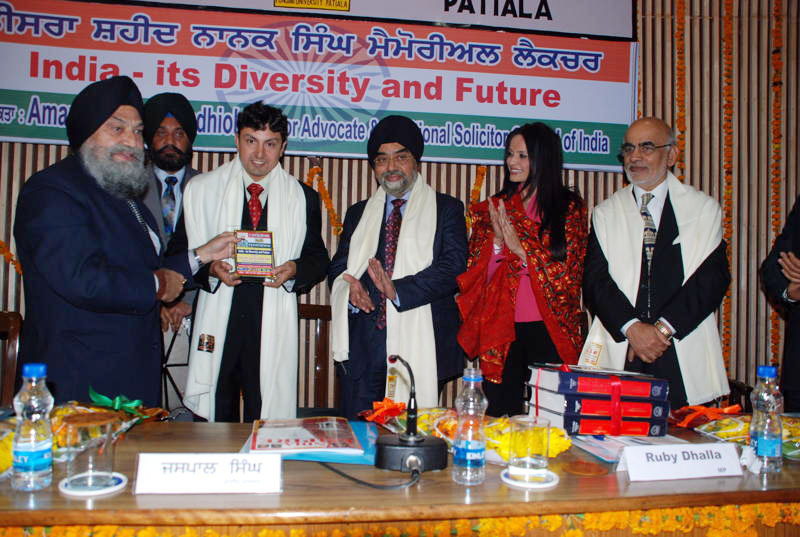 Lord Daljit Rana, House of Lords UK addressing the guests. 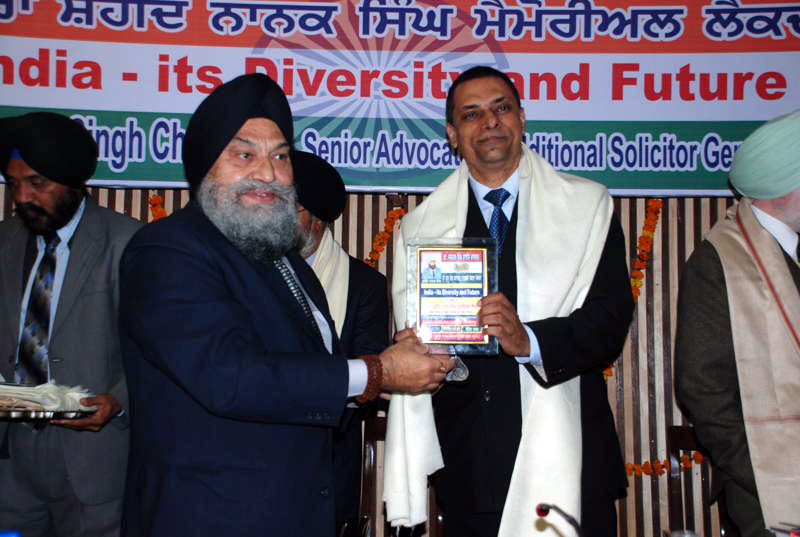 Mr Amarjit Singh Chandhiok being honoured by the VC Dr. Jaspal Singh. 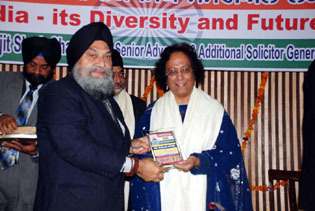 Dr. Ruby Dhalla MP being honoured by the VC. Mr. JS Sachar, Editor Asian Who’s Who being honoured by the VC. 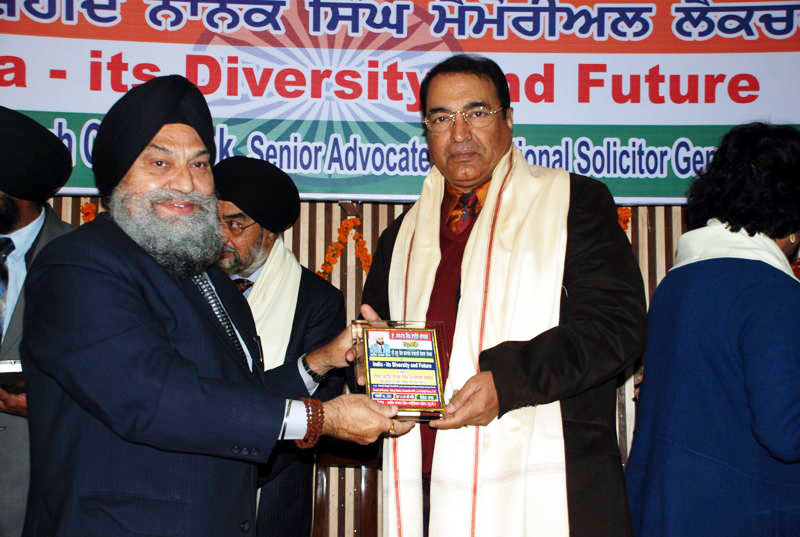 Mr Mukesh Anand, Chairman Shaheed Nanak Singh Foundation being honoured by the VC. Mr.JC Sharma, Former Secretary, Indian Ministry of External Affairs being honoured by the VC. 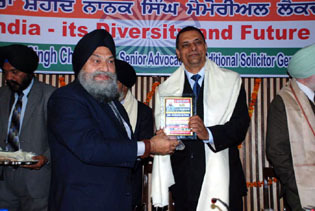 Mr Ravi Gidar CEO Gold Care Homes UK being honoured by the VC. 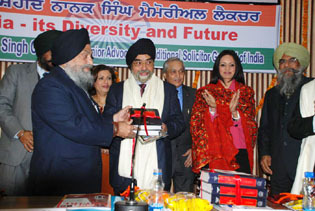 Group Captain DV Arora being honoured by the VC. 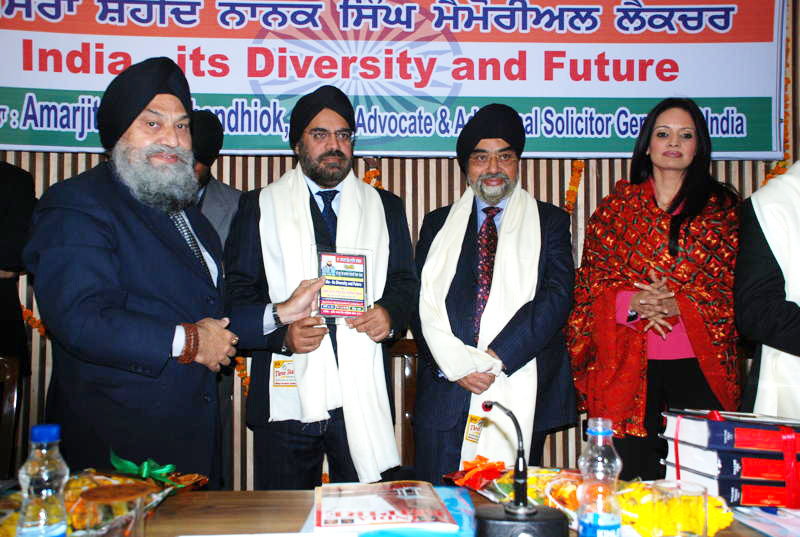 Mr. Alok Goel trustee of SNS Foundation being honoured by the VC. 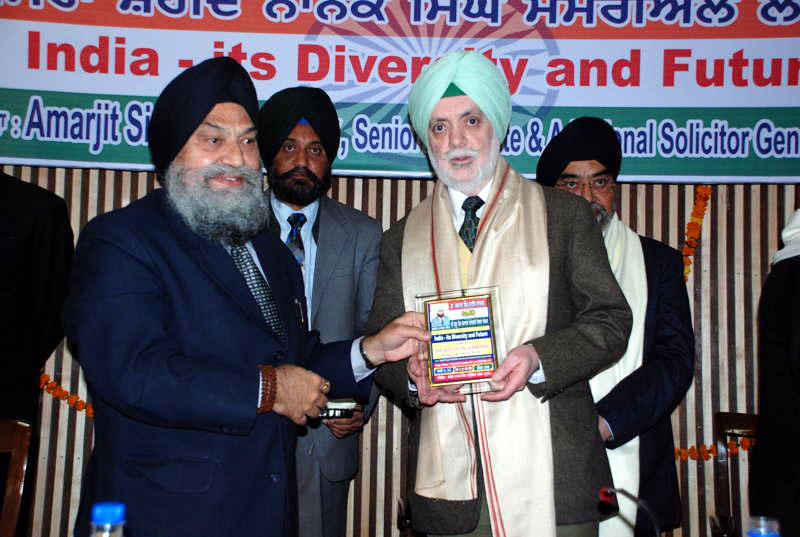 Mr. APS Chawla, Chairman of Roko Cancer MKC Trust being honoured by the VC. Mr. Sukhinder Singh from Canada being honoured by the VC. Mr. Sayantan Chakravarty, editor of India Empire magazine being honoured by the VC. 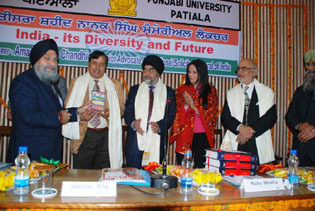 Mr. Avatar Bhogal, film director being honoured by the VC. Mrs. Ravinder Kalsi, trustee of SNS foundation being honoured by the VC.